Twister has become a must use sire when you want to increase stature and extension. He transmits style and eye appeal as well as any bull in the breed. 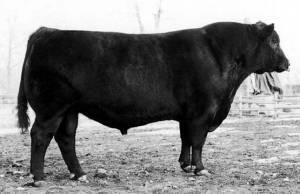 His progeny have performed well at shows and bull tests across the country. Twister is probably as thick a Krugerrand son as you will ever find. Twister has seen heavy use at Beartooth, MT.